37TH DREAM: Happy Birthday Dear Mom! That's my grandmother holding my mother in 1916. 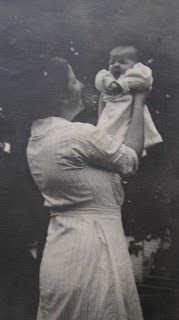 My mother would have been 97 years old today. She died when she was 78 years old in 1994 and still appeared young to me then. Nice picture, Am, and nice little post. I love pictures of my long-gone family. It ties me to their history.